Here we go again. Here are the pairs as I’ve magically matched them up using my children as a labour force. 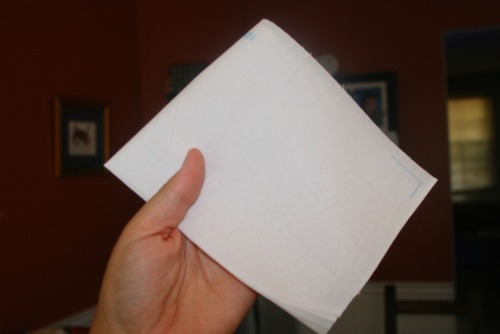 Pardon me for being a day late, my Mabel’s Labels giveaway took a day longer than I thought. Speaking of the day 3 winner is . . . . thanks to random.org this time is Laura! Congrats! Ok back to the partners . . . Please get in touch with your partner, I’m sending out emails today, find out mailing info and start destashing! And I am off to a cottage for a week! For the first time in a few years I’m heading out to a cottage. It’s going to be great, right on the water, sandy area for the kids, a dock . . . oh the list goes on. I’m not sure what the internet situation is up there, and if our phones have a signal my hubby is going to be tethering and using most of our data plan so I thought I’d go easy on it and take time to read and be offline a bit. But fear not! 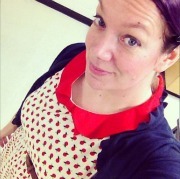 I’ve worked on some of my blog land friends and I’ve got a few guest posts lined up so it’s going to be a good week at SewTara even without me. First off hello to all the new people from Wild Olive! Take a look around. I felt the need to post my last post, not remembering it was giveaway day, usually I’m much more bright and cheery. So pardon the inspiring deep thoughts. On to some fun? Note: These aren’t terrible pictures, honest, keep reading. 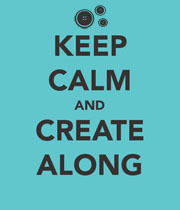 I love Spoonflower, the idea is so great and all the lovely creations are even greater. While clicking around the last time I was there I got to thinking, ‘hey I can probably do this!’. 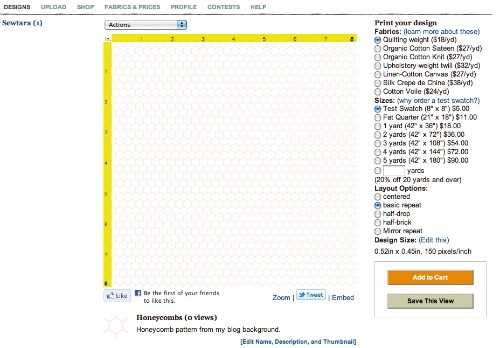 So I uploaded a square of my blog background design, the pink honeycombs. I thought it would be really neat to make something using that. 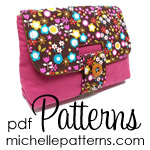 See the lovely pink honeycomb print on the fabric? . . . . Yeah, me either. Guess there’s still some things I have to learn about graphics. I did go back and played around with some of the settings and I think I’ve successfully darkened it. The test swatch will tell me. Hurry up snail mail! Ok I have some linky love to share. The lovely Janee has done a little interrogation post all about me, complete with bed head photo. And of course there’s a giveaway involved as well. So head over and enter before Friday! If you’re a creative blogger, or have just been reading creative blogs for a while you probably already saw Scoutie Girl’s interview with Leigh-Ann from Freckled Nest but I wanted to point it out. It’s full of some great backstory on the growth of Freckled Nest and ideas if you’re on a mission to grow your own crafty empire. 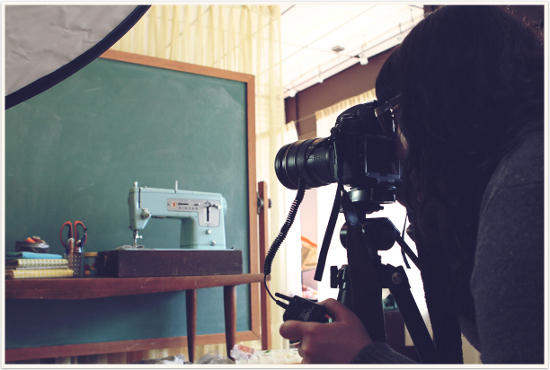 My favourite part was this behind the scenes photo in the interview, LA hard at work shooting my blog banner! Amy has re-emerged with a fun new site, Amy is the party. She’s featuring guest posts all this week. It’s all summer themed to get you all geared up for some summery fun. 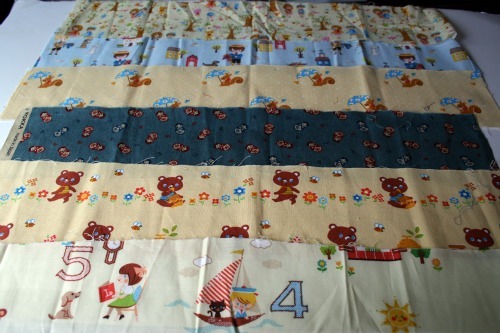 My DIY post will be up Saturday. Annnnnnd I had a bit of a brain wave and wandered over to Spoonflower and turned my block background image into some fabric! I’ve ordered a test swatch to see how it goes. It’s hard to tell from the image on the screen just how it will look in person. Very excited to get it! 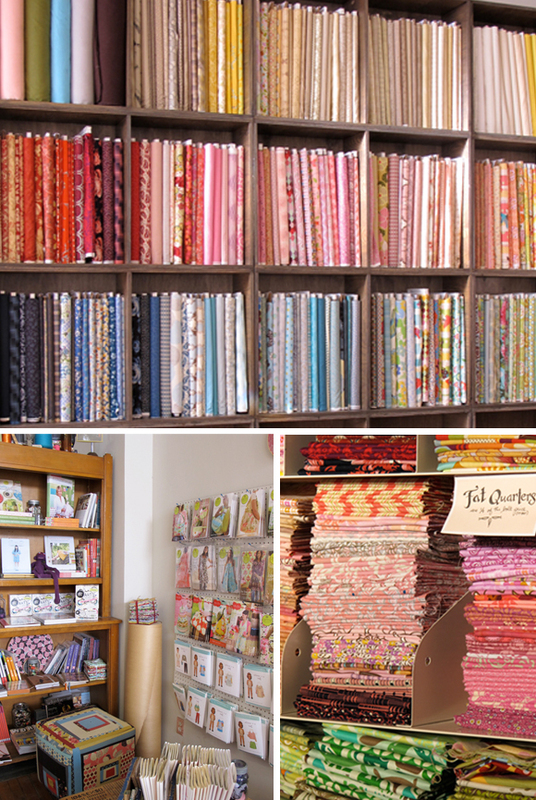 The Workroom, a new to me fabric store. So Monday night I wandered around Toronto as part of enjoying my first night ever in the history of Mommyhood that the boys were out of the house with daddy for just over 24 hours! Strangely I choose to head into the city for the evening instead of enjoying an empty house. I wandered around and took street cars and subways, had a burrito and walked and walked and walked. But it was all worth it because eventually I arrived at The Workroom. 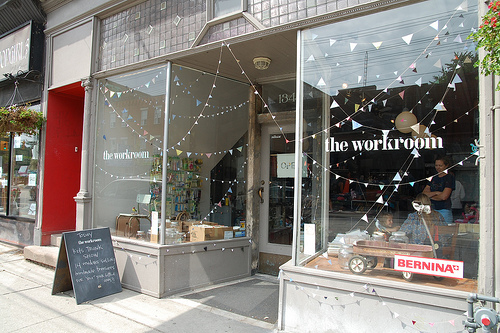 If you live in/near Toronto The Workroom is a craft and sew place that lets you make use of the studio by the hour. They’ve got sewing machines, sergers, cutting tables and other crafty people hanging around. The exciting part for me was all the pretty fabric they have for sale. 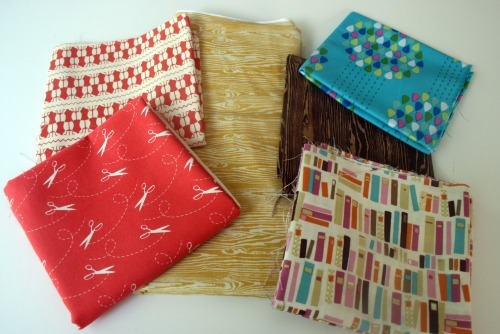 Oh and sewing books, and Japanese craft books. 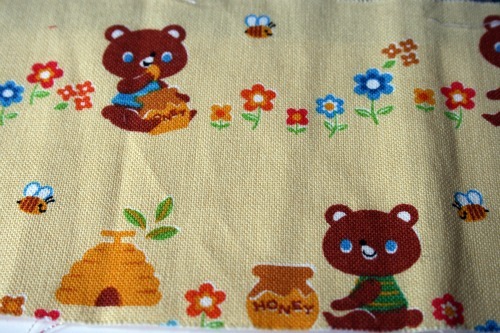 They also have Amy Butler patterns, Colette patterns and some other goodies I can’t remember now. 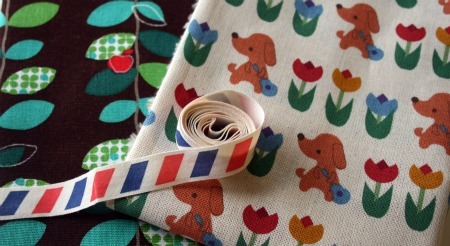 They sell some lovely fabrics and have a whole pile of shelves full of fun fat quarters. Of course I left with some goodies. There’s also a blog if you want to check out some of the things they’re up to. Images stolen from here, here and here. I felt silly asking to take pics with my iphone. I make up words. Have you noticed? On Friday I was super lucky to have 2 fun packages in my mailbox. I had a busy morning so I tossed them in my bag on the way out and ended up opening them at work at the very end of the day. I was dying to open them while on lunch time yard duty but I figured I should watch the kids instead. 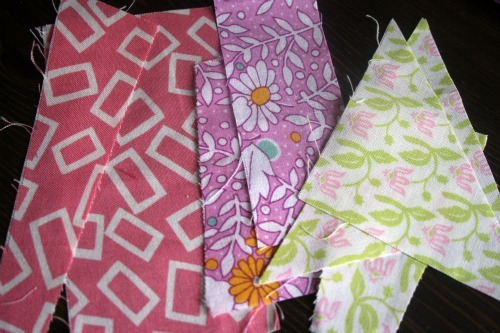 First my scraps from my scrap swap. They came all the way from the Netherlands, and thanks to Wendy for playing twice. I didn’t realize until I got her address that she was so far away but then I was really excited to see what sort of different stuff I might get. 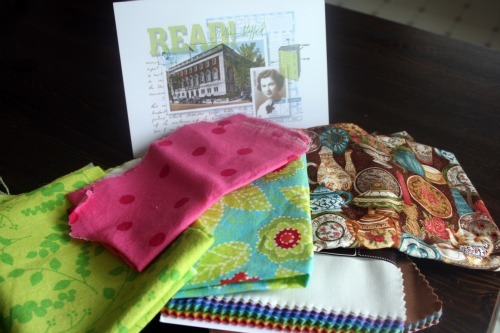 The other package was one of my prizes from the Sew Mama Sew Giveaway Day. I didn’t enter all of the giveaways, there were sooooo many. 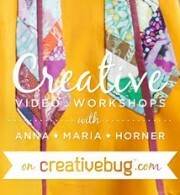 I did click on fellow Canadians to see who’s in my neighbourhood being crafty and bloggy. I also clicked on anyone international because if I was going to win something I wanted it to be all exotic and cool. Even just clicking on a slimmed down list I was still bogging down my browser with tabs and spent the whole holiday Monday clicking around the internet. It was crazy. Ok back to my story. 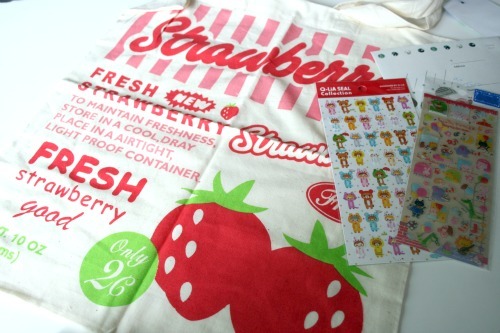 I won these 2 charm packs, some more fabric scraps and there was some lovely tea in the package as well. Canadian Ice Wine tea, the entire box smelled so lovely. Thanks Steph for all the goodies. AND I forgot to share this one before I tore it all apart and spread the pieces here and there in my workspace but these are some of my favourite scraps from the pile I got from Janee over at Yellow Bird, Yellow beard. My treasury worked! My hubby got me this, from here. And these! Only they say ‘Tara’ and not ‘Stephanie blahblah’. 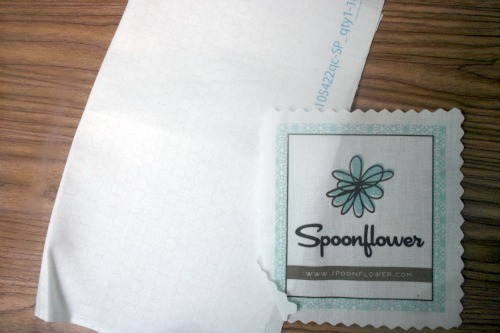 I also took advantage of a Heartsy deal and ordered some packaging supplies from this shop. 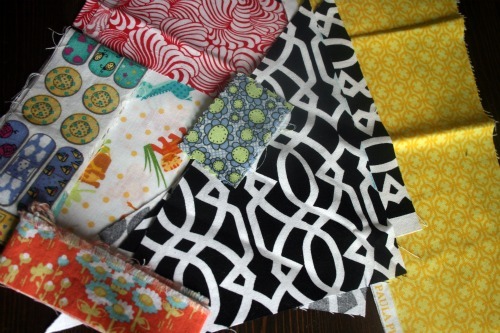 If you missed my fabric swap, or want to see scraps before you get them, my friend Tabatha is looking to part with some lovely pieces in return for some new to her fabric. I was with her when she bought most of these recently and it’s great stuff. Head over if you’re interested in taking a peek. Using the very high tech system of writing names on pieces of paper and picking them out 2 by 2 I assigned partners. You should have an email from me to you and your swap buddy. Please email your partner at the email I’ve used and give them a mailing address for your goodies. Let me know if you didn’t get an email, or if there’s a problem. Wendy is in here two times, since she said she’d play twice. She’s so awesome. Some of you mentioned throwing bits of other things in your package and that’s totally cool but please make sure you have at least 10 oz of usable fabric bits and pieces. 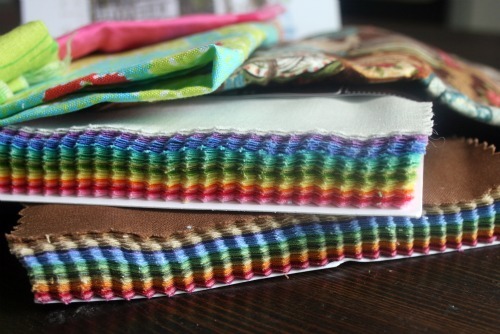 I’m going to be posting project ideas to use these, and other scraps, as well as links to scrap busting ideas. 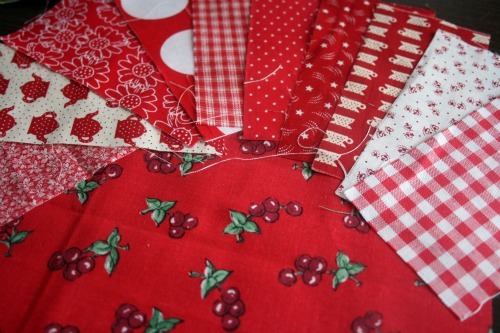 If you’ve been sewing for any amount of time you’ve already noticed how quickly scraps can accumulate. If you’re anything like me, afraid to throw any little bit out in case you can use it later, you have a bunch lying around of various shapes and sizes. 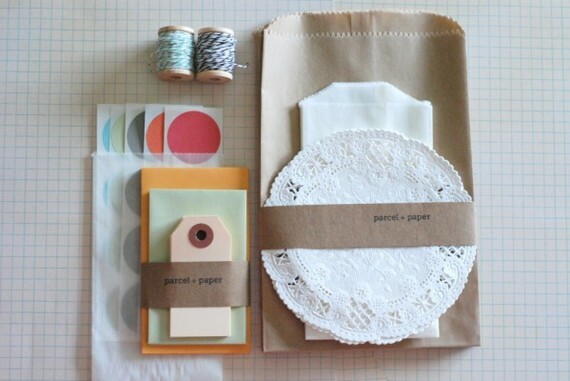 Soooooooo I thought why not share the scrap love and do a little scrap swapping!? Recently I went through my scraps and sort of organzed them into little piles. 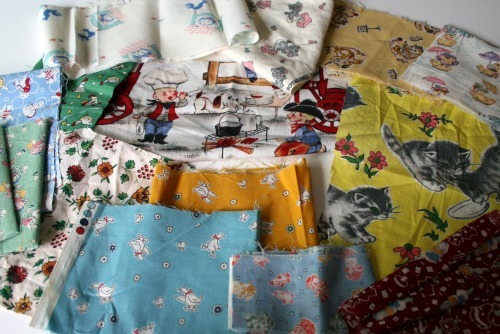 I’ve been saving 4×4 inch japanese fabric scraps, well and to be honest I’ve ordered some from Etsy here and there, in hopes I can make a fun quilt some day. 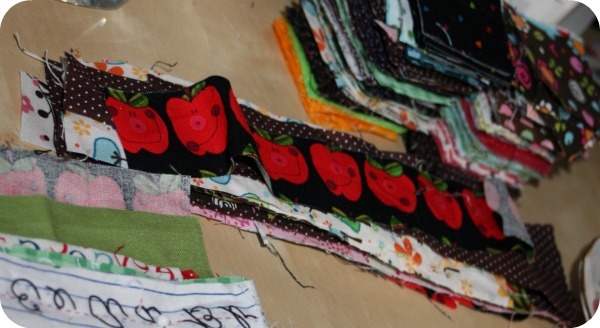 I also spent some time cutting my scraps into 2×2 squares for some projects I have in mind. 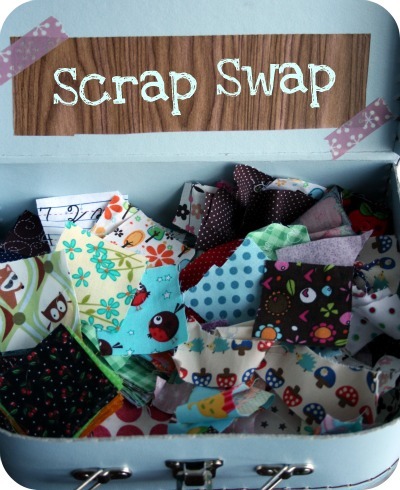 I plan on featuring some fun tutorials to help you make use of your scraps, as well as link to some of the ideas already out there and maybe, just maybe, a source of two in case you have a little scrap collecting problem like someone I know. If you would like to participate just sign up here, I’ll keep taking names until Wednesday January 26th. Then I’ll spend some time matching us all up while you prepare your bundle. Make sure your correct email is in the comment, or enter it with your name when you say you want in. Also, it might be fun to know where you live so we can mix things up a bit. Probably won’t be too exciting if someone is matched with an almost neighbour, just in case you shop at the same fabric store! Be ready to commit to shipping your scrap bundle by the end of the month, we’ll go with the 31st just to make it easy. This will be open to everyone everywhere so please let me know if you object to international shipping and I’ll match you with someone in your country. 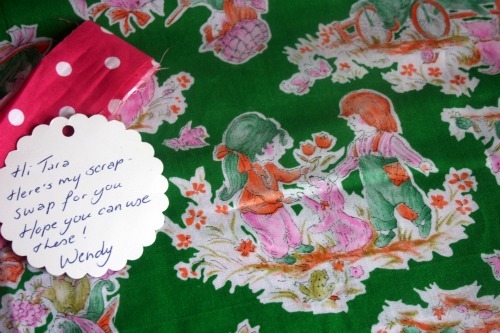 – scraps must measure at least 2 inches by 2 inches, there is no maximum size but it is supposed to help you destash your scrap bin so sending fat quarters probably won’t help with that. 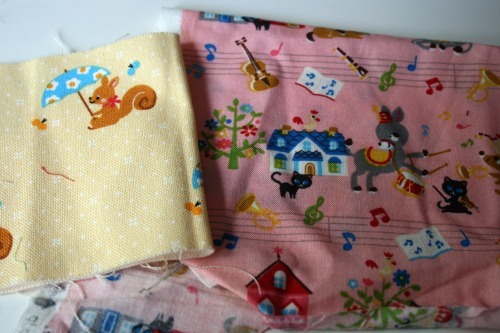 Wheee new fabrics and some Japanese ribbon! Spent some time just before the holidays shopping for myself, as I’m sure many of you did. I’ve become addicted to checking Etsy’s front page a few times a day, sometimes even before it’s had a chance to change. 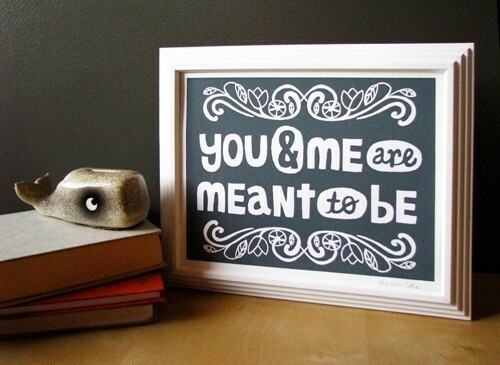 I’ve also been in many treasuries lately which has led me clicking around the handmade heaven that is Etsy. Here are some things that arrived last week. 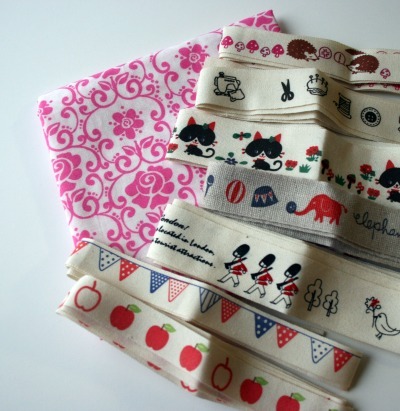 These lovely fabric ribbons from boqinana. 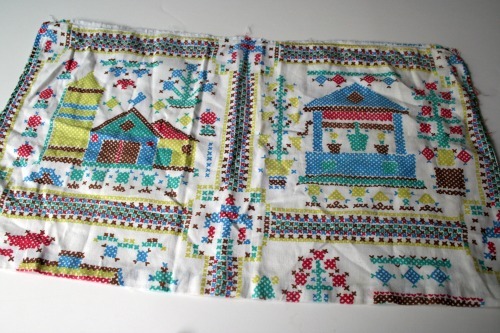 The fabric was just bonus! 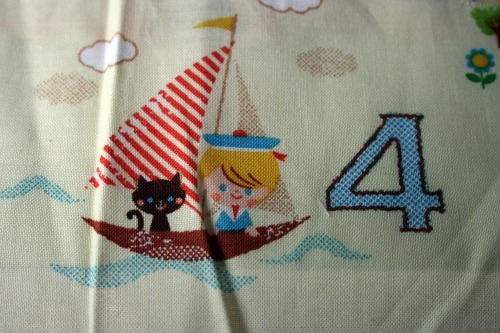 Fun fabric and ribbon from DoodooShop. I have plans for that air mail ribbon, I’ve been busting with excitement waiting for it to arrive so I can start the project. These arrived a while ago and I just didn’t get to posting about them yet. 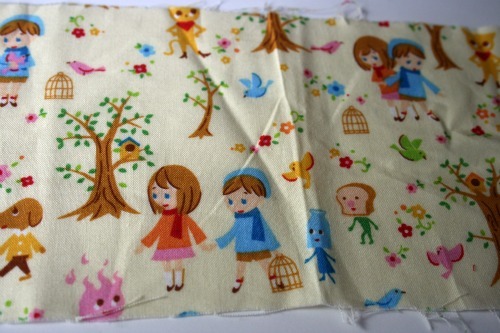 Fabric scraps from starlitnest. She apologized for a delay in shipping, which I hadn’t really noticed, and said she added some extra fabric to the mix to make it up to me. 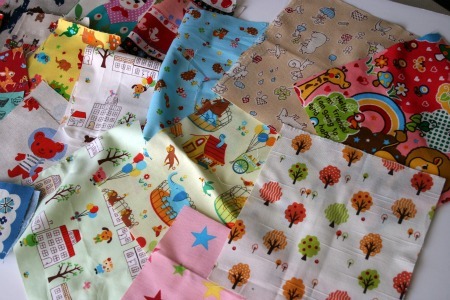 Isn’t it bad enough I have my own stash of scraps but I have to keep buying other people’s!? 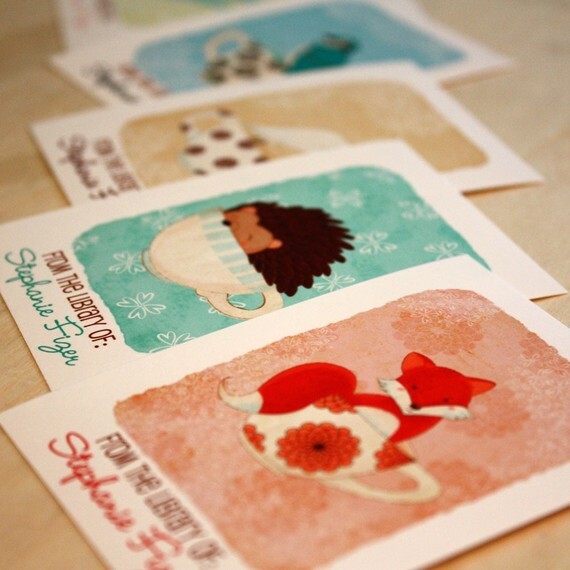 I also have some pretty masking tapes coming from kimamaya. Should be here shortly. It was probably evil of me to be ordering ‘just because’ things during the holiday shipping rush. Ooops.